Respected Russian defense attorney and legal scholar Genri Reznik has resigned from the faculty of the Moscow State Law Academy to protest the installation there of a plaque commemorating a 1924 speech by Soviet dictator Josef Stalin. "On June 17, 1924, in this hall, Josef Vissarionovich Stalin delivered a report on the results of the 13th congress of the Russian Communist Party," the plaque reads. The original plaque was placed on the site at the height of the Stalin-era cult of personality in 1949 and was dismantled in the early 1990s following the collapse of the Soviet Union. "The first thing the Bolshevik leader did was to bury the law," Reznik wrote on his blog on the website of Ekho Moskvy. "Stalin embodies massive extrajudicial mechanisms and repressions, including personal summonses, two- and three-judge hearings, legalized torture, and the liquidation of the independent judiciary, the presumption of innocence, and the principle of legal advocacy. In an interview with RFE/RL's Russian Service, Reznik said he made the decision immediately upon learning of the plaque, which was installed sometime during the week of June 17-23, and he isn't interested in the positions of other faculty members. "I don't march in step and I didn't speak with any of my colleagues," Reznik said. "Later I spoke with two of them who expressed shock that such a plaque had appeared." The academy told RFE/RL that the plaque had been installed in keeping with a 1960 decree by the Soviet-era Council of Ministers of the Russian Soviet Federative Socialist Republic (RSFSR) on the state protection of historical landmarks. "That act is still in effect and directly envisions the commemoration of this hall as a cultural monument of local significance that comes under official protection," the academy said in a written response to RFE/RL. Nikolai Artyomov, head of the labor union representing the workers and students of the academy, said he had been informed about the plaque in advance and supported the initiative. "I support the opinion of our president [Vladimir Putin] that there were different times and different leaders," Artyomov told RFE/RL. "Regarding the evil-doings that happened during that time, all of it has been ascribed to [Stalin]. But this is a contentious point, historians say. As far as this plaque goes, why not hang it? Yes, the leader of the country, Josef Stalin, was here. He was the leader for a long time. Our people associated his name with our victory in the Great Patriotic War." "And, yes, we have many people who to this day believe that life was significantly better under Stalin, more honest, more solid, and more correct," Artyomov concluded. An online petition calling for the plaque to be removed has picked up more than 6,000 signatures in four days. On June 28, the prestigious Moscow Higher School of Economics issued a letter to the law academy expressing disdain about the plaque and saying it would not participate in any joint projects or events with the academy as long as the plaque remains in place. Although Russia this year is marking the 80th anniversary of the peak of Stalin's Great Terror in 1937, the dictator's reputation has been steadily on the rise since Putin took over the country in 2000. 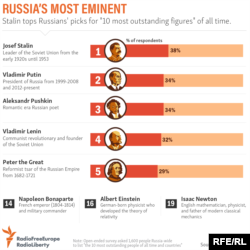 A poll released this week on whom Russians view as the most outstanding person in Russian history saw Stalin come in first place, with 38 percent. A similar poll in 1989 saw just 12 percent voting for Stalin. With 34 percent, Putin tied for second place in the latest poll alongside 19th-century poet Aleksandr Pushkin. ​In a recent interview program by U.S. filmmaker Oliver Stone, Putin said that the "excessive demonization" of Stalin "is one means of attacking the Soviet Union and Russia." Critics, Putin said, use Stalin's legacy "to show that today's Russia carries on itself some kind of birthmarks of Stalinism." Stalin ruled the Soviet Union from the mid-1920s until his death in 1953 and was responsible for the deaths of some 15 million to 30 million through executions, labor camps, mass deportations, and avoidable famines.